Free download Windows Password Recovery Tool latest version with Standard, Professional, Enterprise and Ultimate editions. It is a computer program that helps you to reset or change your Windows password. In case, you have forgot your Windows password or some unauthorized person has changed your password, then Windows Password Recovery Tool will help you to reset your Windows password. Windows Password Recovery Tool can easily change or remove your Windows local or domain password. You can also create new account to login with the help of this computer application. 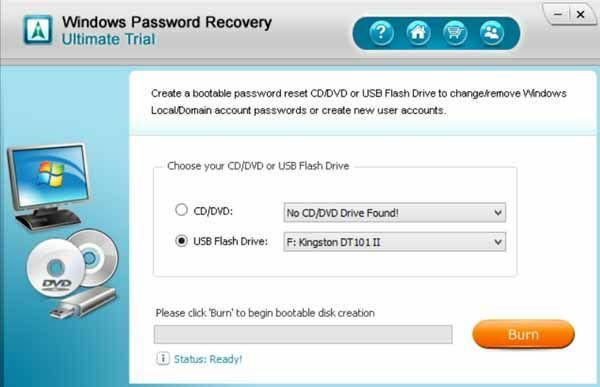 You have to create a bootable CD/DVD or USB flash drive with the help of Windows Password Recovery Tool. It is very easy to install and use Windows Password Recovery Tool. It is very light weight and take few seconds to install. Download the setup file from the download link given below. After downloading, simply run the setup and start to install. After installation, it will start and you can easily use. It is not difficult to use. You will see only two options at the program window screen. These are CD/DVD and USB Flash Drive. If there is no CD/DVD ROM attached with your computer, it will show you the message “No CD/DVD Drive Found!”. After selecting the device you want to make bootable for password recovery, click on “Burn” button at the bottom right corner of the program. It will take few seconds to make recover disk or USB. After successful completion, you will see the message. Now you are ready to use it to recover or remove your Windows password. According to its developers, this program supports Windows 2000, XP, Vista, 7, 8 as well as Server 2000/2003(R2) and 2008(R2). They also claim that this program can be run on all brands of PC such as Dell, HP, IBM, Sony, Asus, Lenovo etc.